The link between the Southern Oscillation Index (SOI) and temperatures is impressive, though, not perfect. The SOI scale is inverted and shifted 7 months into the future to make it easier on us mortals to see the link. The reason the SOI is so influential is the sheer volume of heat content on-the-move. The cold waters of the deep dark abyss, have snuck up near the surface to steal heat from the ephemeral air. 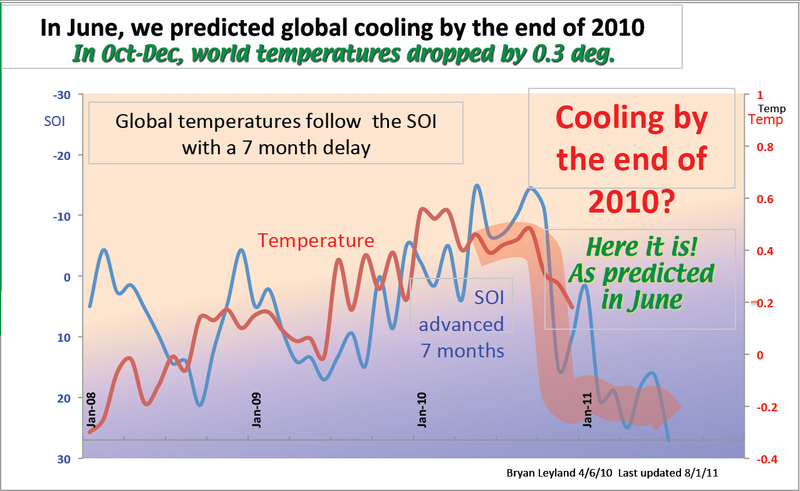 In a post last June, William Kininmonth explains how the whole planet could suddenly “get warmer” during an El Nino, and then suddenly cool again. The ocean floor holds 3km of close-to-freezing water covering 70% of the planet. “The Southern Oscillation Index (SOI) value for December of +27 is the highest December SOI value on record, as well as being the highest value for any month since November 1973.” From BoM “ENSO wrap-up” webpage. On the SOI archive webpage I can’t see any similar sustained strong La Nina conditions since 1917, at which time 3 months (Jul, Aug, Sep) were all greater than +27.1 (respectively 28.3, 34.8, 29.7). The only other months when this figure was exceeded are April 1904 (+31.7) and Nov 1973 ((+31.6). The last 6 months (Jul-Dec 2010) have all high positive SOI’s and this is surpassed only by 1917, which had SOI greater than +8 in 11 months of the year (Feb-Dec) and it continued into the first 3 of 1918. (An SOI of +8 regarded as the La Nina threshold is exceeded for 3 months). According to the HadCRUT3 dataset, the annual average temperature anomaly for 1917 was -0.507 deg C, putting it within 0.1 degrees of the coldest year since 1850 (i.e. 1911 at -0.582). The August 6 prediction confirmed: Is the cold weather coming? Ever wondered how the whole planet could suddenly “get warmer” during an El Nino, and then suddenly cool again? William Kininmonth has the answer. The deep oceans drive the atmosphere. *Yes, I do realize that the SOI doesn’t predict the weather at Heathrow. 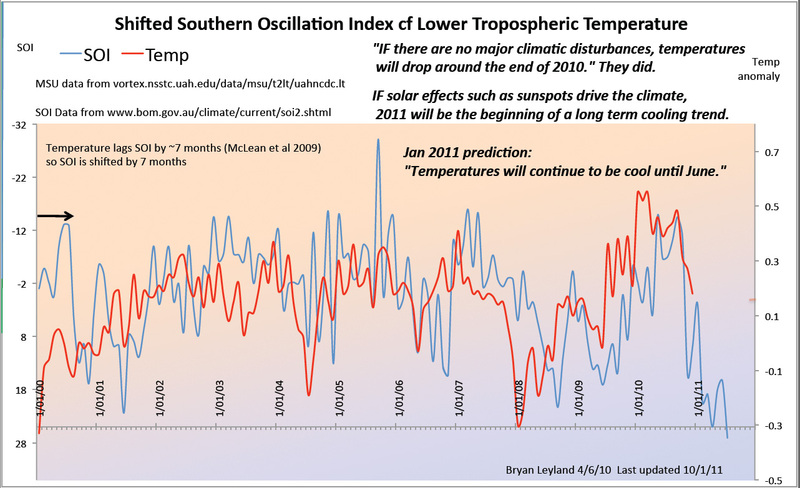 Richard at the Climate Conversation (NZ) has also written about Leylands SOI Graph.